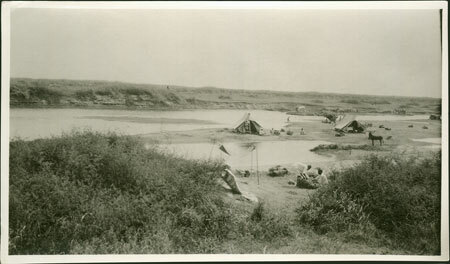 Looking down from a river bank to the tents of a colonial encampment in the dry river channel, with pools of water in the riverbed. The expedition's porters can be seen around the tents, some preparing equipment, possibly for departure. Morton, Chris. "European encampment by river" Southern Sudan Project (in development). 03 Jan. 2006. Pitt Rivers Museum. <http://southernsudan.prm.ox.ac.uk/details/1998.204.5.67/>.